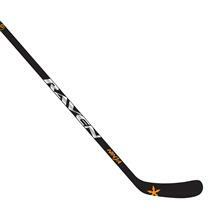 by Source For Sports Hockey Sep 13, 2018 Raven Hockey designs hockey sticks specifically for kids to help them stick handle better and raise the puck. Raven Hockey is a start-up based in Calgary, Alberta. Their goal is simple: create hockey sticks with the proper flex for young players. 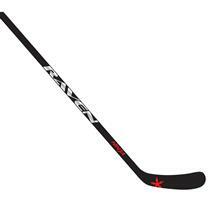 Raven Hockey sticks are designed to address the gaps between youth and junior level hockey sticks, and provide minor hockey players the ideal hockey stick for their size and weight. Raven Hockey designs and produces kids’ hockey sticks tailored to players aged 5-12 using the ‘Rule of Flex’, meaning the Flex Rating of a player’s stick equals less than fifty percent of that player’s body weight. 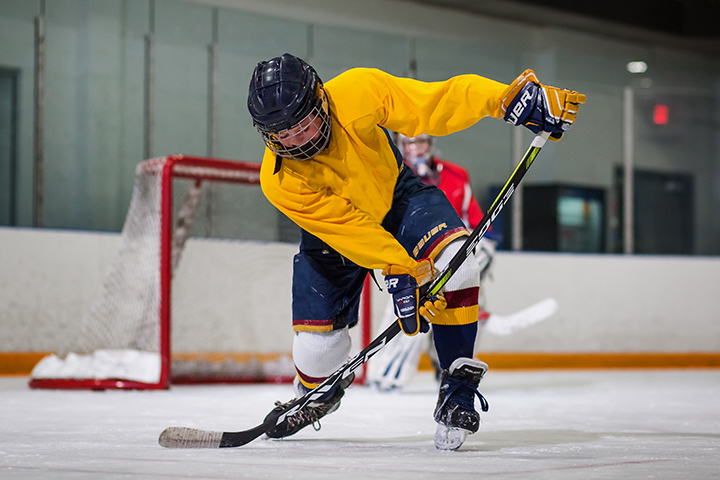 This Rule of Flex ensures each young player has the proper hockey stick flex for their size, and helps them develop their skills on the ice. To put some extra mustard on a shot, hockey players need to be able to control the power they’re loading into their stick up until the point of puck release. If the hockey stick is too stiff for younger hockey players, they won’t be able to execute their shot to the best of their ability, let alone develop into better shooters. The stick-fitting system developed by Raven Hockey is called ‘Raven FLEX’. Sticks come in the following flex ratings and sizes: 20 (47”), 30 (52”), 40 (56”), and 50 (60”). These ratings are ideal for the Novice, Atom, Peewee, and Bantam age groups respectively. 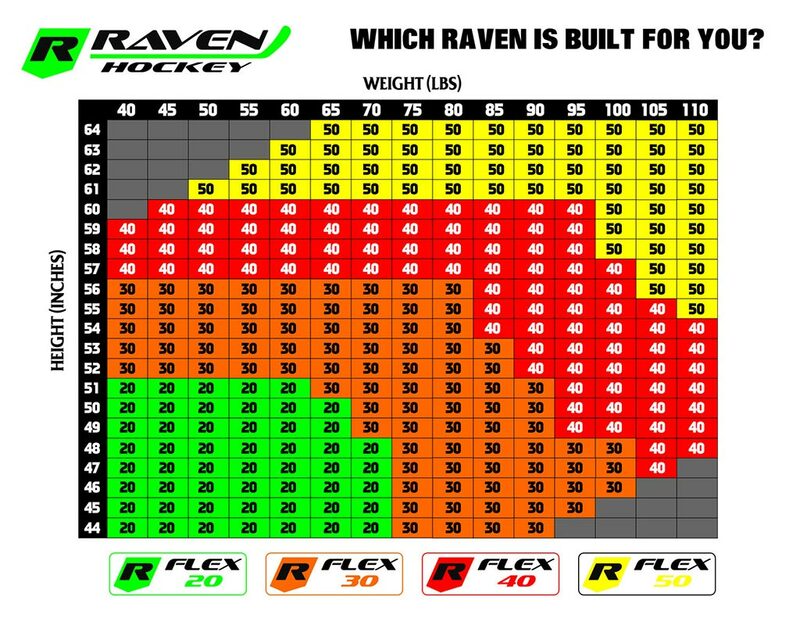 These stick flex ratings represent the different stages in a hockey player’s development, and each Raven hockey stick flex is designed to help youth hockey players get the most out of their game as they grow. These sticks are easy to grip due to their thicker shaft, and easier to control the puck with because of the stick’s larger blade. The shorter, kid-friendly lengths of Raven sticks eliminate the need for stick-cutting, a practice that actually increases stick flex. Check out our Raven Hockey sticks selection here . Raven Hockey sticks will not only help younger players to make the most of their on-ice experience, but also allow players to feel comfortable and confident while they’re in a crucial developmental stage of their game. If you’re new to hockey or a parent looking for the perfect stick for your child, you’ll definitely want to check out the kids’ stick line by Raven Hockey at your local Source For Sports store. Source For Sports. We Know Our Stuff. Raven Hockey Flex 20 Junior Hockey Stick available for sale at your local Source For Sports store. 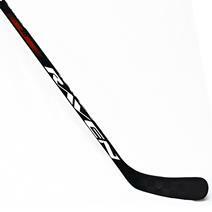 Raven Hockey Ninja Flex 20 Junior Hockey Stick available for sale at your local Source For Sports store. Raven Hockey Flex 30 Junior Hockey Stick available for sale at your local Source For Sports store. Raven Hockey Ninja Flex 30 Junior Hockey Stick available for sale at your local Source For Sports store. Raven Hockey Flex 40 Junior Hockey Stick available for sale at your local Source For Sports store. 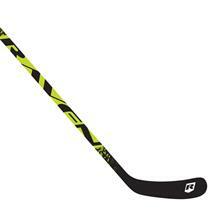 Raven Hockey Ninja Flex 40 Junior Hockey Stick available for sale at your local Source For Sports store. Raven Hockey Flex 50 Junior Hockey Stick available for sale at your local Source For Sports store. Raven Hockey Ninja Flex 50 Junior Hockey Stick available for sale at your local Source For Sports store. 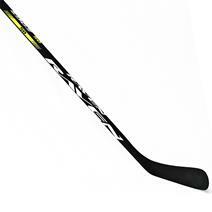 Raven Edge 20 Flex Hockey Stick available for sale at your local Source For Sports store. Raven Edge 40 Flex Hockey Stick available for sale at your local Source For Sports store. 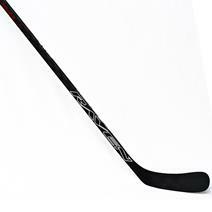 Raven Ninja III 40 Flex Hockey Stick available for sale at your local Source For Sports store. 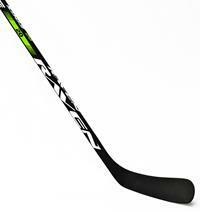 Raven Edge 50 Flex Hockey Stick available for sale at your local Source For Sports store.